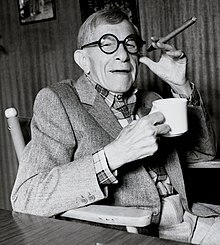 George Burns (born Nathan Birnbaum; Yiddish: נתן ביר��בוים‎; January 20, 1896 – March 9, 1996) was an American comedian, actor, singer, and writer. He was one of the few entertainers whose career successfully spanned vaudeville, radio, film and television. His arched eyebrow and cigar-smoke punctuation became familiar trademarks for over three quarters of a century. 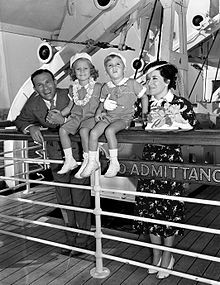 He and his wife, Gracie Allen, appeared on radio, television, and film as the comedy duo Burns and Allen. Burns and Allen got a start in motion pictures with a series of comic short films in the late 1920s and early 1930s. Their feature credits in the mid- to late-1930s included The Big Broadcast; International House (1933), Six of a Kind (1934), (the latter two films with W.C. Fields), The Big Broadcast of 1936, The Big Broadcast of 1937, A Damsel in Distress (1937) in which they danced step-for-step with Fred Astaire, and College Swing (1938) in which Bob Hope made one of his early film appearances. Honolulu would be Burns's last movie for nearly 40 years.